Oh, flash mobs. How we love thee. Any excuse to get rambunctious and cause wide spread mayhem is usually enjoyed by all. If you’ve been living under a rock and don’t know what a flash mob is, here you go: a flash mob is a group of people who seemingly appear out of thin air to perform an unusually and basically pointless act for a brief time and then disperse. Thanks, Wikipedia, for that. But using a bunch of fancy words to describe the phenomenon is not nearly as impressive as observing it. In order to observe some of the best flash mobs out there, we turn to the world’s best and brightest – college students. 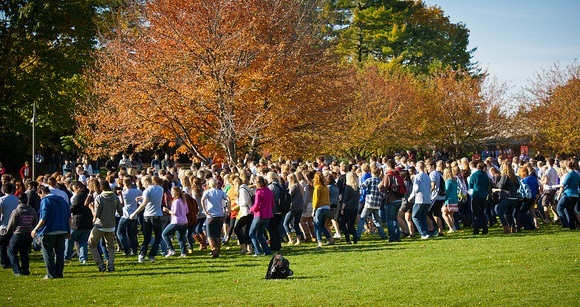 Our college years are packed full of valuable learning experiences – walks of shame, all night study sessions, keg stands, tailgating…and flash mobs. At what other point in time are random acts of disruption better received?